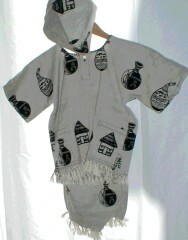 Gourd Art is a hand woven, hand printed child’s shorts set. The shirt has cap sleeves and a simple hand embroidered chain stitch around the round button close v neck. There are two front pockets. It is marked medium and measures 16″ across the chest and 19″ from shoulder to hand knotted fringed hem. The shorts are 15″ from waist to fringed hem with a 5 1/2″ inseam. There are two side slit pockets. The elastic waist measures 20″ relaxed and 30″ fully extended.